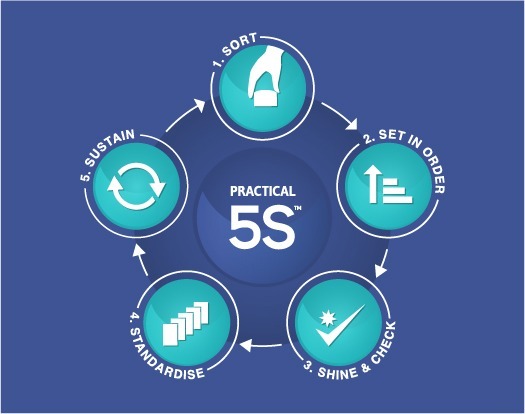 TXM Practical 5STM is a simple practical approach that delivers sustainable ongoing improvement by driving accountability to the front line in your business. SORT OUT what is in the area to determine what is needed, what can be stored elsewhere and what can be disposed of. SET IN ORDER the area by determining a place for everything and putting everything in its place. SHINE AND CHECK the area by giving it a thorough clean to set a new benchmark for cleanliness and to reveal the sources of dirt. STANDARDISE the workplace by establishing standards and procedures to constantly maintain the standard of the area. SUSTAIN the change through agreeing on processes to implement ongoing improvements and audit results. This establishes a culture of continuous improvement. Simple practical system for workplace organisation that leads to sustained results. Engages and empowers front line teams and places the accountability for compliance with them. Easy to understand tools and techniques that you can extend across your business. Effective start point for workplace standards, standard work, autonomous maintenance and set up time reduction. Up to 15% productivity time through reduced movement waste and “looking time”. Elimination of hazards leads to improved safety – up to 30% injury rate reduction. Increased employee morale and reduced turnover. Ferguson Plarre is a major industrial bakery supplying quality cakes and pastries fresh daily to a chain of over 50 retail stores. Ferguson Plarre is a great example of application of Lean Manufacturing in the Food Industry.